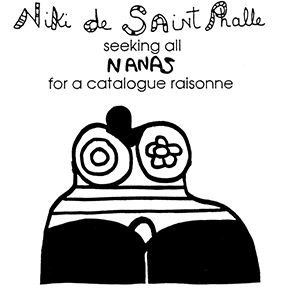 “Nanas” of Niki de Saint Phalle is forthcoming. Niki de Saint Phalle has created a large number of “Nanas” in her career with different materials, in different shapes and dimensions. The catalogue raisonné will document this aspect of Niki de Saint Phalle’s oeuvre. It will illustrate the range of Niki de Saint Phalle’s creative achievements in this field. The Catalogue Raisonné of Niki de Saint Phalle’s “Nanas” aims to be a comprehensive publication that will reproduce and list all known works. It will establish as definitive an inventory as possible of Niki de Saint Phalle’s authenticated “Nanas”. While we hope you will be able to supply as many details as possible for the accuracy of our research, we understand that some information may be sensitive, personal or private. Please be assured that all information provided will be treated in the strictest confidentiality. All requests for anonymity will be fully respected. With thanks for your time and support for the project.